Ride the Machine: There is no escape. "The authorities in ShanXi province, China are taking a far more drastic approach. 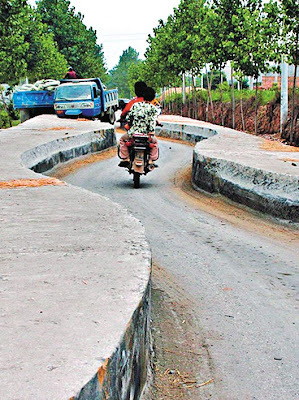 They built a 100 foot long, 2 foot high, winding speed block smack dab in the middle of the Jing Zhuang highway." I've ridden across China, the authorities have a very good reason. The standard of riding is shocking, and unlike the surrouding countries they have superb roads to ride on meaning extreme speed with minimal protection or basic ability. I'm a little sad, but extremely relieved that they outlawed everything over 250cc.